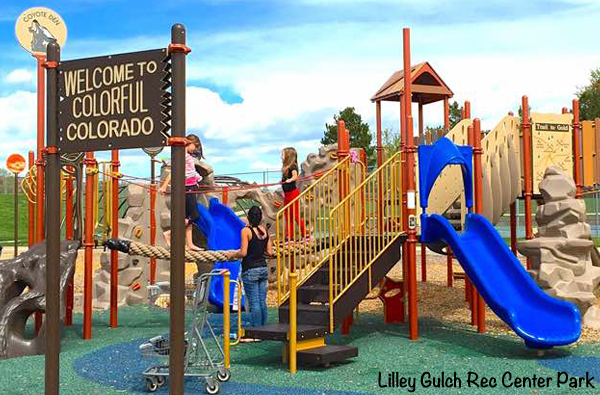 Fall is a great time to visit some new playgrounds in the Denver area. Not too hot, not too cold. 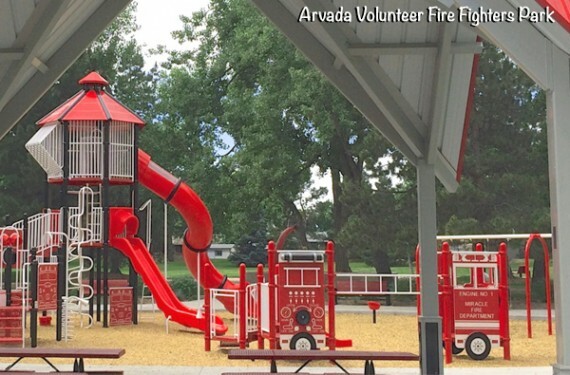 I’m currently completing work on a review of all 740 public playgrounds in the metro area, from Golden to Aurora and Broomfield to Centennial. Here I take a closer look at seven themed play areas I came across that stand out from the rest. Take your pick and don’t stop exploring! 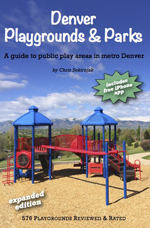 Get additional ideas in my guide “Denver Playgrounds & Parks,” available as a book and iPhone app. The book is sold at local stores and online. For details, visit my website playgroundsdenver.com. This large park features everything from a lake and a creek to a rec center, fountain, and skate park. 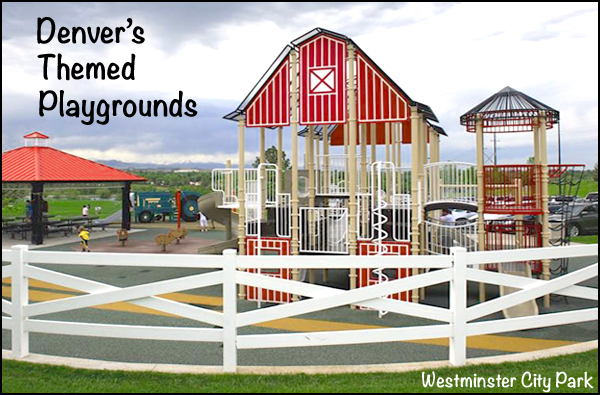 The farm-themed playground contains a multi-level barn structure, a play tractor with a slide, and several spring toys shaped like pigs. 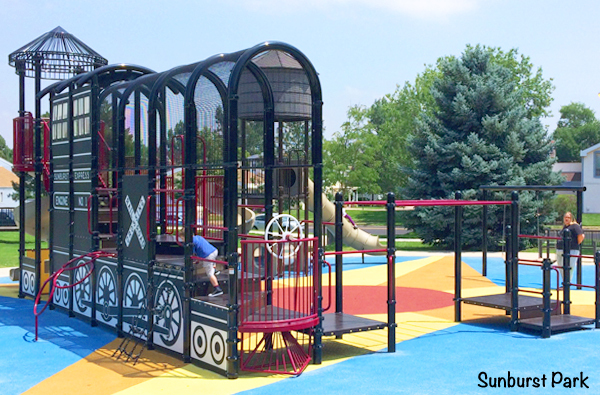 Other features include two fireman poles, a cage spinner, and a platform swing. Come visit this tall rocket waiting on its launch pad! You can climb to the top level, enter through one of the Shuttle Entrances, and adjust its large mission control panel. There is an alien-themed teeter-totter, a large suspended blue platform, and a spinning red ring (for sitting or lying inside). This newly built play area has Colorado as its theme, and you can learn quite a bit here – from the state flower (and state dinosaur) to Colorado’s gold mines and the state’s 12 most common animal footprints. The entire playground seems designed to be climbable: walls, logs, ladders, ropes, and huge climbing structures. 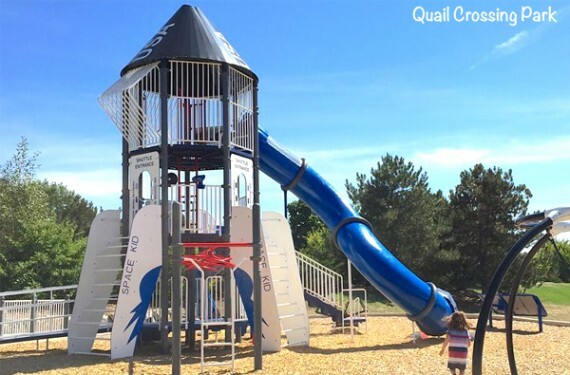 You will also find a cage spinner, a glider, and a fun climbing tunnel. 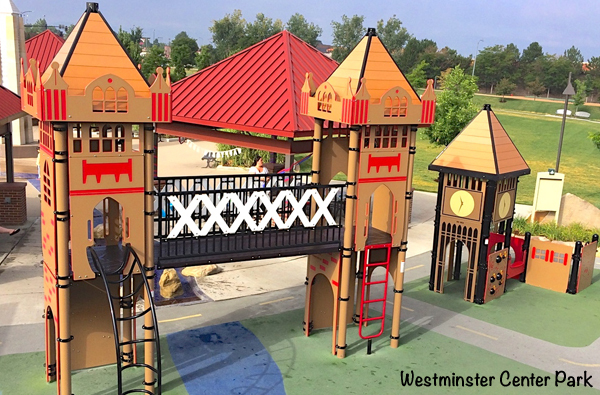 This park surprises with a London theme, complete with the River Thames, Tower Bridge, and Big Ben. There’s also a slide built into a “rock” hill and a ship sailing on the river. Artificial trees, boulders, and log tunnels add climbing challenges, and the many water features in this park are great for cooling down on warm days. The dominant color at this playground is fire engine red, from slides and swings to picnic benches and trash cans. The fireman theme is rounded out by fire bells, a fireman pole, a play fire engine, and lots of fireman ladders. There are also spinners, a tall slide, and a play house. Come and have a firefighting experience! 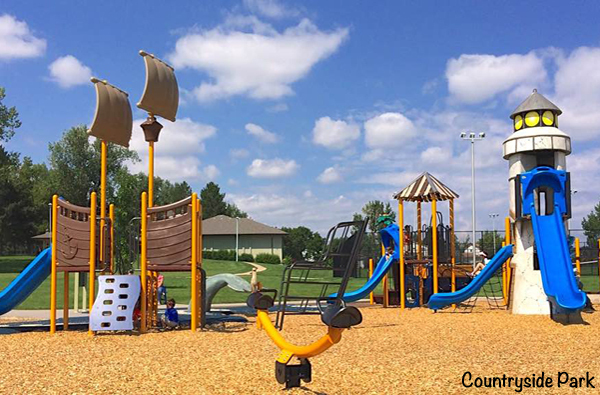 A newly built hilltop park with mountain views invites you to play in its nautically themed playground. There are boats, palm trees, sails, a lighthouse, even the tail of a whale. Try the stairs inside the lighthouse, the rocking boat, or the spinner. Dirt trails beckon you to explore the area, and there is an outdoor pool next door for hot days. A huge train engine structure dominates this playground and offers ladders, slides, tunnels, and a large steering wheel. There is also a tall climbable water tower with slides. You will find a play train station and a smaller toddler area with wheels, a slide, and swings, all situated on a colorful rubber surface. Guest blogger Chris Sekirnjak has been in the Denver area since 2004 and currently lives in Applewood (Wheat Ridge) with his wife and two young children. Outdoor fun has been his main form of entertainment ever since he was a little boy growing up in Austria. His two guide books Denver Playgrounds & Parks and Run, Stroll, Hike were published in 2014-2015 and have recently been adapted to iPhone apps. Number 4 is actually Peter Pan themed. It has an alligator and pirate ship and even a Lil Peter Pan in one of the windows.